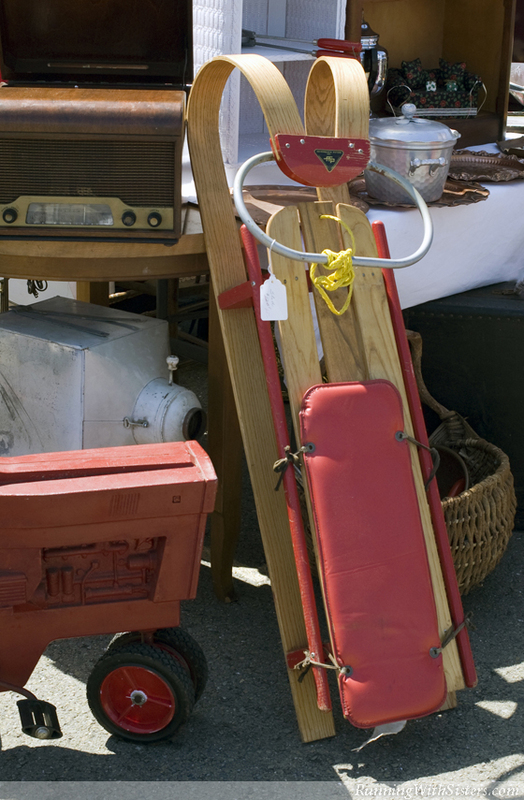 Guarantee a white Christmas with wintry flea market finds. It’s snowing at the flea market! Vendors change their wares with the season, and now is a great time for wintry wonders. 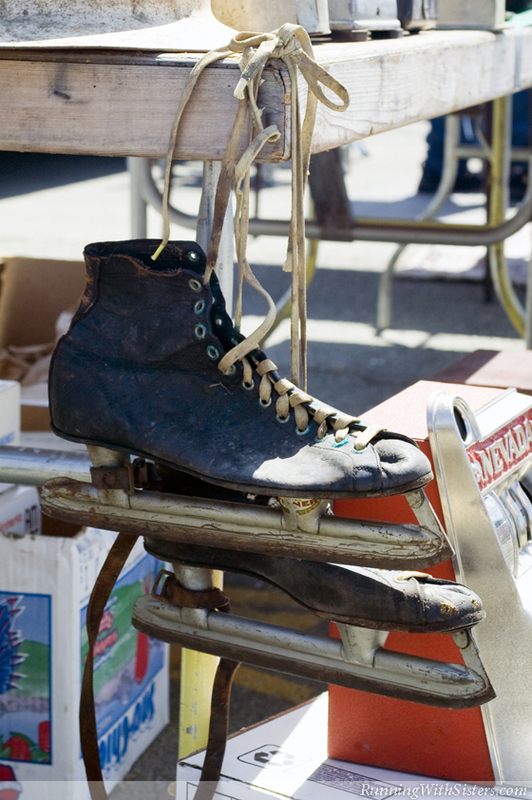 A pair of ice skates hung over the back of a chair feels like a white Christmas, even if you live in the Sunshine State. So over the river and through the woods, we went shopping for snowy collectibles. 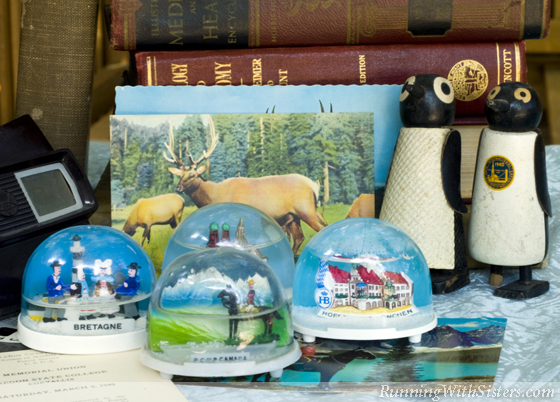 We knew one thing from the start, Jennifer would be adding to her snow globe collection. She found a cute one with a Canadian Mountie inside and haggled the price down from $12 to $7. Next we found our favorite postcard dealer. For the holidays, we like to tuck vintage postcards into the edges of frames. The cards were priced individually (in pencil on the back), but we pooled our picks and got a deal that averaged out to $1 a card. Jennifer went with reindeer, and Kitty chose several snow scenes with birds. 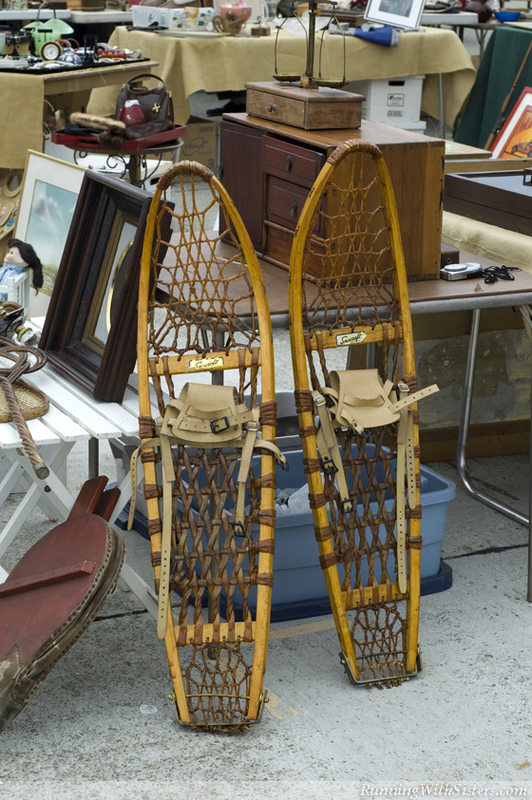 We were on the lookout for some bigger decorating finds, so we were delighted to see a pair of real snowshoes. They were marked $125, but when we asked about them we found out they were sold. Someone got a bargain! Then Kitty spotted a dealer with several snowy paint-by-numbers, and she fell in love with a scene featuring a buck and a doe. 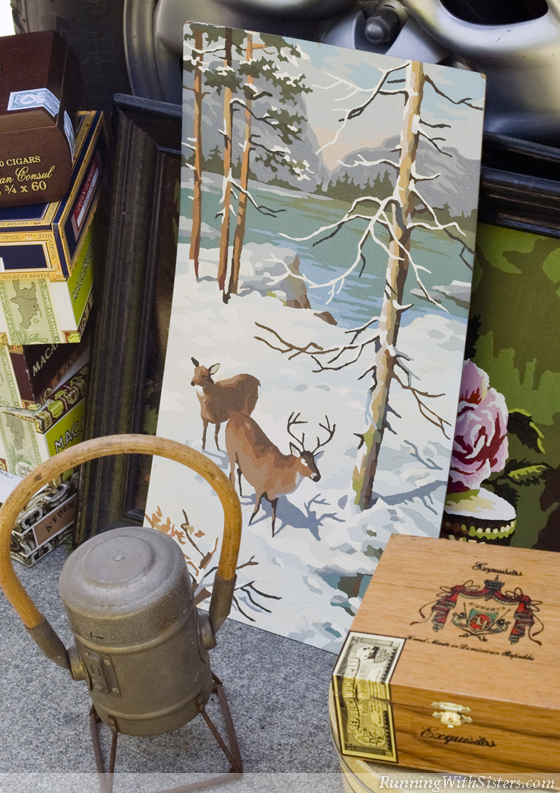 (Swapping out art is a simple way to change your décor for the season!) 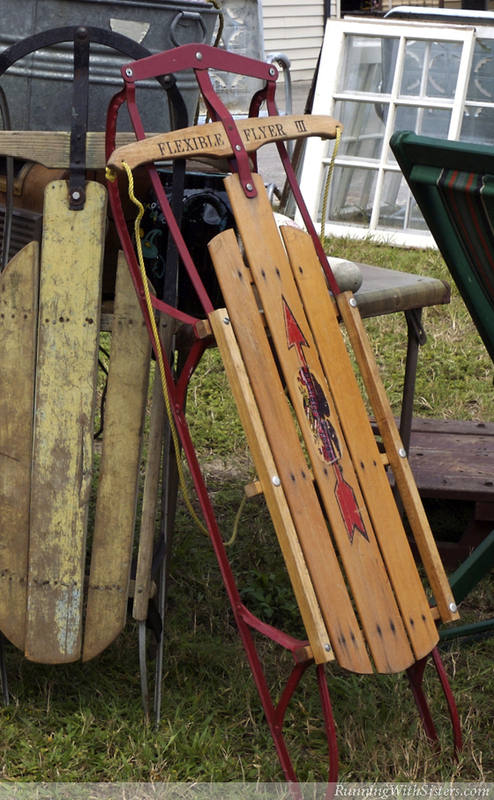 Jennifer was pricing sleds the whole day and finally found a red and white one for only $40. She plans to set it next to her Christmas tree to hold her wrapped gifts. Instant heirloom! We’ve wanted real sleigh bells since we were kids. Our mom decorates her carousel horse with a brass and leather strand every Christmas. Back in the day, people adorned their horses with sleigh bells as a status symbol, but they served a practical purpose, too. As the horses trotted, the bells would jingle warning pedestrians to step aside. 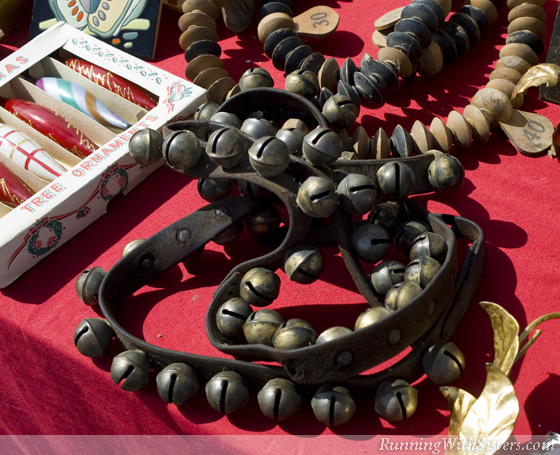 Today, you can find sleigh bells at the flea market for $100 to $200, but expect to pay $300 for a long strand in good condition. Buy a set to give your dining table a little giddy-up. Just run the sleigh bells down the center on a bed of evergreen boughs. Or greet your guests with a jingle-jangle by hanging them from your front door. Ring-a-ding-ding! Nothing conjures up the joy of a snow day like an old-fashioned sled. While they started out as a way to move goods across frozen landscapes, sleds soon became a symbol of winter fun. One of the best-known sleds, the Flexible Flyer, was invented in the late 1800s by a farm tools manufacturer to keep his factory workers busy during off-season months. His sled had a unique design that made it fast and easy to steer, giving kids the thrill of a lifetime. It is such an icon of American history that they have one at the Smithsonian. Get your own and load it up with poinsettias on the hearth, or lean one on the porch with a holly wreath in the center. Then, at winter’s first snow, take that childhood treasure to the nearest slope and go for a ride!